Accra, Ghana- December 5, 2017 – In an effort to accelerate startups from emerging markets, the Global Startup Ecosystem will be hosting major summits in developing countries across the globe. Haiti was the first country to host the largest annual gathering of innovators addressing humanity’s grandest challenges with over 100 global speakers in 2017. Ghana will join the global initiative with top companies, celebrities and government officials on July 18-20, 2018. The event will host speakers from Google, Facebook, Uber, Airbnb, Twitter, IBM, Microsoft, and more. Over 40+ media representatives from Forbes, Inc Magazine, Fast Company, Black Enterprise, NY Times and more will be in attendance. Silicon Valley, USA- October 10, 2017 – To accelerate the commercialization of space, Draper University has partnered with the Global Startup Ecosystem and LightSpeed Innovations to host the first annual Space Tech Summit on January 23-24, 2018. The Space Tech Summit brings together hundreds of entrepreneurs, pioneers, and creatives under one roof to address humanity’s grandest challenges via space technology. The summit also serves to bring key stakeholders that will accelerate both the exploration and the expansion of space into mainstream audiences. The 2018 Space Tech Summit will achieve this by covering two themes. Part one is centered on “Ecosystem Influencers of Space Tech” which spotlights the unexpected leaders in space- from mainstream media reporters to celebrities. Insights from these leaders drives a new generation of changemakers leveraging space tech for humanity. Part two is centered on “The Future Exploration and Commercialization of Space” with an analysis of the technologies being used to kick off startups, SME’s and enterprises; along with a deep dive look into the contributions of VC fund managers, angel investors, research think tanks, governments and corporate innovators to drive the space industry to new heights. The event will host speakers from Google, X-Prize, IBM, NASA, SpaceX, Boeing, Amazon and more. Over 20+ media representatives from Space News, Forbes, Bloomberg, Wired Magazine, Tech Crunch and more will also be in attendance. “Thinking 10X is the first lesson at Draper University and a recurring theme in our efforts to enable entrepreneurs to build innovative companies that will drive the change that we all want to see in the world. We are excited to be partnering with LightSpeed Innovations and Global Startup Ecosystem (GSE) to launch this initiative and play our part in building and funding the space tech frontier.” Asra Nadeem – Director Entrepreneurial Programs. “This summit is not only for the innovators of today but also for the game-changers of tomorrow. From Elon Musk’s SpaceX to Richard Branson’s Virgin Galactic to Peter Diamandis’s International Space University, the acceleration of space as a final tech frontier can be sparked by anyone who has an interest and passion for this movement. As a leader in ecosystem acceleration, we at GSE are proud to continue the legacy of space exploration.” Einstein Ntim- Partner @ Global Startup Ecosystem. For interests related to speaking, press and partnerships please direct inquiries to [email protected] and purchase tickets via www.spacetechsummit.com. Tim Draper, legendary Silicon Valley venture capitalist founded Draper University in 2012 with a vision and belief that in order to change the world we have to change education. Draper University aims to teach entrepreneurship globally in an entirely new way. Through hands on training, an innovative curriculum and thought leadership Draper University brings together young entrepreneurs, startup founders, executives and investors all under one roof. In the last four years, Draper University alumni have created 371 companies, raised $89M+ in early stage funding, 27 have been accepted into YC, 500 and other accelerators and 7 have been recognized in Forbes 30 under 30. Global Startup Ecosystem (GSE): is the world’s largest ecosystem accelerator. With a mission to educate, inspire and prepare startup communities for the digital age, GSE brings together both private and public stakeholders to address humanity’s grandest challenges via tech and entrepreneurship. From hosting the world’s first and largest digital accelerator to launching disruptive tech summits in emerging markets and emerging industries, GSE serves as the future platform for the world’s leading ecosystem hubs. GSE’s online network accelerates 1000+ companies a year across 90+ countries in 7 key regions – Africa, Asia, America, Caribbean, Europe, Latin Americaand the Middle East with a focus in frontier tech industries such as Space, Artificial Intelligence, Blockchain, and more. GSE’s offline network accelerates thousands of entrepreneurs, influencers and creatives via annual tech summits featuring 100 global speakers per event. LightSpeed Innovations is an aerospace focused business accelerator that sources and mentors aerospace entrepreneurs and startup companies. It enables founders/entrepreneurs to build sustainable businesses, create value, and strive to achieve revenues and profitability as soon as possible through partnering with a cadre of elite aerospace focused investors all looking to support building out the aerospace entrepreneurial ecosystem. As an adjunct to the accelerator program, LightSpeed runs the Frontier Tech Investment Network (FTIN), a network that meets monthly where LightSpeed connects experienced investors with early stage startups aiming to commercialize ‘Deep Tech’. On June 6th & 7th, 2017, with a backdrop of the Caribbean sun rising over a white-sandy beach, the Global Startup Ecosystems (GSE) team, founded by Christine Souffrant Ntim, hosted the first annual Haiti Tech Summit in partnership with the Minister of Tourism, at the all-inclusive Royal Decameron Beach Resort in Haiti. Yes, Haiti. After touring the world attending global conferences spanning Dubai, Russia, Nigeria and San Francisco, Souffrant-Ntim, a Haitian-American, noticed that ecosystems across industries were developing and drawing investments as a result of these events and gatherings. “If these conferences are serving as a catalyst for development and innovation in these communities,” she thought to herself, “why not do this in Haiti?”. With that came the vision to launch the Haiti Tech Summit with a 13-year commitment to gather the world’s most influential investors, entrepreneurs and industry leaders in Haiti – a country often characterized by economic poverty and political instability. The 10-member Haiti Tech Summit team, composed of both local and diaspora Haitians, were driven by the mission to rebrand Haiti and shift the narrative towards its potential to serve as a hub for innovation in the Caribbean. The team humbly expected an audience of 200 local and international attendees, and instead ended up hosting over 500 entrepreneurs, influencers and speakers all gathered to discuss how technology and innovation could accelerate sectors such as education, government, health, sports, media, culture, agriculture and tourism in Haiti. 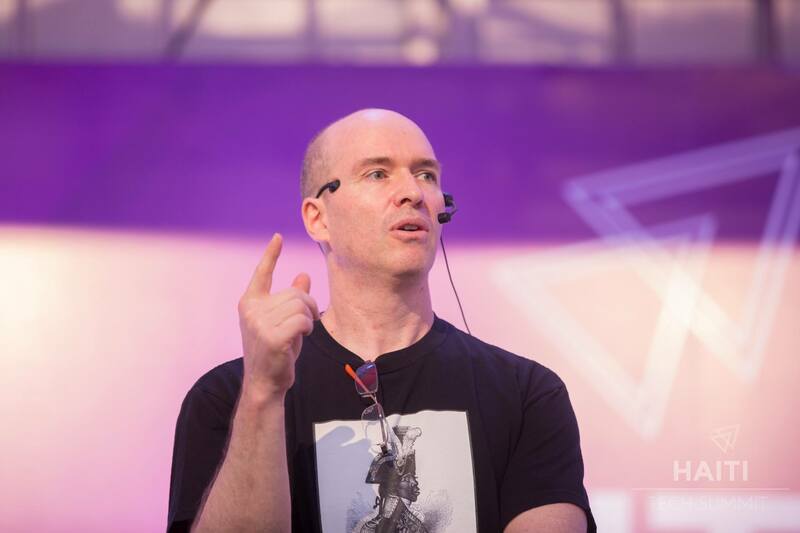 On Day 1, the Summit kicked-off with an inspiring and powerful keynote from Ben Horowitz, (Partner and Co-Founder of renown VC firm Andreessen Horowitz,) entitled “To Create Culture, Start a Revolution.” In his keynote, Horowitz, a fan of Haitian liberator, Toussaint L’Overture, paid homage and called for Haitians to change their mindset in order to fuel collaboration and ultimately change the country’s narrative. After a standing ovation, attendees then listened to keynotes and panels from 100+ influencers and speakers from over 18 countries, representing top companies such as Google, Facebook, Airbnb, Linkedin, Uber, Mastercard, Paypal, Github, Singularity, Draper University, Access Haiti, Center for Financial Investments, Hertz and many more. 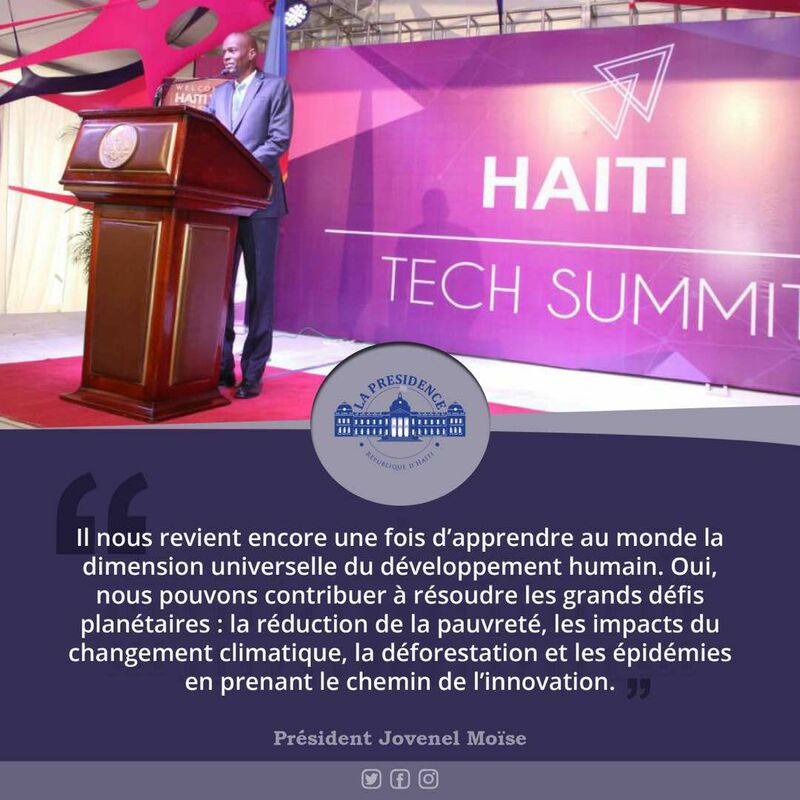 The end of Day 1 was concluded by Haiti’s President, Jovenel Moise, who addressed the crowd in a moving speech calling for unity and innovation, as well as his administration’s commitment to supporting the Haiti Tech Summit team in helping to advance the nation. Other notable guests over the 2-day Summit included Roy Glasberg from Google’s Launchpad Accelerator, Matt Terrell from Facebook’s Developers Circle, and Vicky Jeudy from Netflix’s Original Series “Orange is the New Black”. Over 40 media outlets attended including representatives from Tech Crunch, NY Times, Essence, Ebony, Black Enterprise, Inc., Forbes, Huffington Post, LoopHaiti, L’Union Suite, Chokarella, Trace Media, Le Nouvelliste and more. In reflecting on the impact of the Summit, one of the most noteworthy accomplishments was putting Haiti back on the map as one of the most dynamic entrepreneurial ecosystems in the world. This Summit not only helped to galvanize local entrepreneurs, small businesses and government entities but, most importantly, connected them to the international community. One momentus outcome in particular was a young Haitian artificial intelligence researcher named Ben Toussaint who was invited by Roy Glasberg, Head of Google’s Lauchpad Accelerator Program, to Silicon Valley for two weeks in July. During his two-week visit, Toussaint will have the opportunity to mentor startups in Google’s Accelerator program on artificial intelligence. In addition, Luigi Voltaire a local Haitian entrepreneur, was also invited by one of our speakers to Silicon Valley to attend an event focused on investments in emerging markets. The Haiti Tech Summit sets out to build a community of creators and policy makers determined to reshape the narrative for Haiti not only as a hub for innovation but also an international tourist destination. The organizers of the Summit are currently laying the groundwork for the next year’s Summit scheduled for June 21-23, 2018. To learn more information, visit www.haititechsummit.com and join the Facebook group.